Tired of feeling unhappy? Looking for inner calm? Here are a few methods to consider. It doesn’t take a genius to figure out why being happy is imperative to every individual: it lights our faces from within, boosts our immune system, liberates us from the boundaries we’ve unintentionally set for ourselves and, ultimately, lets us live a more fulfilling life. It works better and longer than any beauty elixir or medicinal marvel. It wasn’t until I turned 25 that the epiphany occurred. It was happiness, or the lack of it. And how much easier said than attained. Mind you, I’m not exactly Miserable Mandy, but I wasn’t as exhilarated as I’d like to be. The accurate term to describe a person like me, I imagine, is habitual naysayer. I think optimism is overrated, I fret about my passing youth, I long for straighter teeth, and I feel deep envy for others who are able to get more sleep than I. Scientists say these thoughts are damaging. For instance, Oxford University psychologist Michael Argyle has proven that unhappy people tend to accomplish fewer goals and are generally inefficient, because of their self-manufactured helplessness. So I decided to embark on a mission to dispel the emotional malaise that was purportedly ruining my chances at life. It’s now or never. The means: A balanced life of regular exercise, healthy food and plenty of R&R. The gist of this section is that happiness isn’t something you can go out and buy, like a pill, a therapy session, or a thousand-dollar suit. You need to nurture it by living your best life. As celebrity doctor Mehmet Oz asserts, “You’re the Starbucks generation. You have more distractions than any generation before you, like cell phones, TiVo, YouTube — it’s endless. The definition of “best life” here varies from one person to the other, but the key is in not being too extreme either way. For instance, we all know that sweating it out keeps the blues away, and a proper diet of low saturated fats gives us more energy. However, studies have shown that giving your body a break now and again could also increase its efficacy. Hence the more you struggle towards something, the more unhappy you’ll be. Think “all work and no play makes Jack a dull boy” and vice versa. That way, happiness will come at a time when you least expect it. The experience: Luckily for me, the solutions don’t involve swearing off skinny lattes, tossing my laptop aside and taking off for a month-long trek in Nepal. I knew what I really needed: a much-deserved break from all that routine, albeit a short one. My salvation came in the form of Dr Baskaran Kosthi, 41-plus, and Dorothy Ang, 28, yoga gurus who had invited me for a 3D/2N retreat on the sleepy island of Langkawi, where I could languish the days away in a gorgeous kampung-style chalet in an idyllic resort and meet new people. The yoga and vegetarian diet was optional, though I was all revved up and ready to embrace this sweet, new lifestyle. Frankly, I find yoga asanas a bit sadistic, but when Ang told me that we’d be doing them outdoors, my resolve to remain lethargic crumbled. It was also, admittedly, the only form of exercise I’d be getting the entire week. So, there we were, on beaches, by waterfalls and overlooking miles of padi fields, getting whipped into shape twice a day. We were put on our choice of traditional and delightfully sinful Italian and Langkawi food, which was far less depressing than going completely vegan. There was even a reiki and spa session thrown in for the benefit of our sore muscles. The whole experience left me rejuvenated and inspired. Not a single inch of me was exhausted, despite having to wake up early every day while I was there. Needless to say, I was finally able to fall into a long, dreamless sleep when I got home. The verdict: 8/10. Count me in for the next getaway! 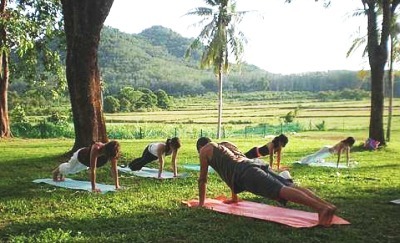 For enquiries, call 012-421 5970 /019-652 0683 or visit www.langkawi-yoga.com.